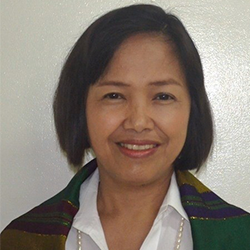 Dr. Agnes M. Brazal is associate professor and research fellow at the De la Salle University, Manila. She is past President and founding member of the DaKaTeo (Catholic Theological Society of the Philippines) and one of the first "mothers" of the Ecclesia of Women in Asia (EWA), an association of Catholic women theologians in Asia. Before becoming a professional theologian, she worked as community organizer, campus minister/student organizer, coordinator of the Basic Ecclesial Community Program of the Diocese of Catarman, Samar, and formator of social development workers. She is author of forthcoming book Liberation-Postcolonial Ethics in the Philippines(Orbis, 2019), co-author of Intercultural Church(Borderless Press, 2015), and co-editor of eight anthologies: Living with (out) Borders(Orbis, 2016; 3rdplace, Immigration category, Catholic Press Association award); The Second Plenary Council of the Philippines(AdMU, 2016); Church in an Age of Global Migration (Palgrave Macmillan, 2016); Theology and Power(Paulist Press, 2016);Feminist Cyberethics in Asia(Palgrave Macmillan, 2014); Transformative Theological Ethics(AdMU, 2010); Faith on the Move(AdMU, 2008); and Body and Sexuality(AdMU, 2007; finalist, National Book Development award). She has published more than 50 articles in book chapters and journals that include Theological Studies, Concilium, Questions Liturgiques, Asian Horizons, Hapag, and others. She currently serves as international advisory board member of Theological Studies, Louvain Studies, and International Journal of Asian Christianities, editorial board member of Budhiand Asian Theological Ethics Book Series, board member of DaKaTeo,Institute for Church and Social Issues and St. Catherine of Siena Virtual College, UK, and joint treasurer of EWA. She obtained her MA/STL and PhD/SThD from the Katholieke Universiteit Leuven. The crucifixion of Jesus and the death of many other martyrs for faith and justice shows that the promotion of God’s reign is not easy and entails sacrifice. The powers that be will not readily give up their dominion. But our faith provides us with the basis of hope that in the end, it is God’s reign that will last forever.